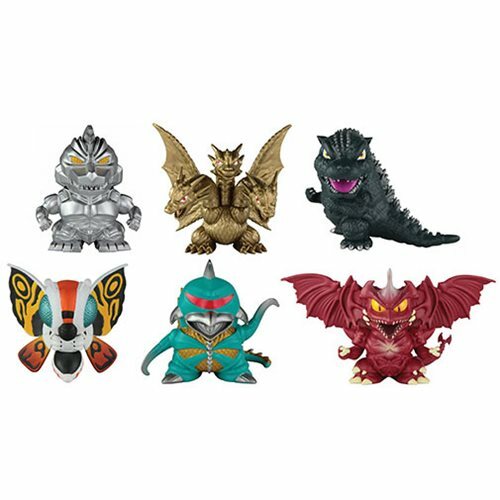 From Bandai the Godzilla Chibi Figure 6-Pack features some of the most iconic Godzilla, mecha and kaiju ever created. From Toho's hit Godzilla film franchise these six Chibi kaiju figures feature intricate sculpting and enhanced deco with a super deformed style that makes them ready for play or display. Perfect for Godzilla fans of all ages this displayable package features '93 Godzilla and Heisei Mechagodzilla from 1993's Godzilla vs. Mechagodzilla II, Heisei Mothra from 1992's Godzilla vs. Mothra, Heisei King Ghidorah from 1991's Godzilla vs. King Ghidorah, Showa Gigan from 1972's Godzilla vs. Gigan and Heisei Destroyah from 1995's Godzilla vs. Destroyah. DC Batman: TAS Figure Collector Mr. Freeze Figure with Mag.